Walmart construction seen from Tehachapi Boulevard. Construction continues on the new Walmart. Work continues on the Walmart viewed from Tucker Road. With block walls and metal framing rising from the site on the east side of Tucker Road, construction of the Tehachapi Walmart is progressing rapidly six months into the project. "The building and the roof are erected and much of the site concrete is in place. Extensive underground plumbing is in place and initial utility work on Tehachapi Boulevard and Tucker Road has started. The city enjoys a positive working relationship with the contractor, Eleven Western Builders, Inc., who has been attentive to the work in our opinion," said Jay Schlosser, city development services director. He added that the completion date is still set for this summer. 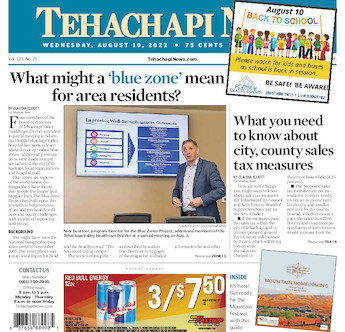 The contractor declined to comment on construction progress and directed Tehachapi News to contact Walmart Corp., which has not yet replied to a request for information.